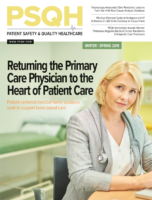 This article appears in the November 2017 issue of Patient Safety Monitor Journal. A patient handoff (also known as transitioning) is both the act of passing a patient between caregivers and the information exchanged between the sender (the provider giving away the patient) and the receiver (the provider taking the patient). These transfers can be as dramatic as airlifting a patient to a specialty hospital and telling the EMTs that the patient thinks she can fly and will try to jump out of the helicopter, or as mundane as a nurse ending her shift and telling her replacement the patient has been taken off a certain medicine. This exchange is a huge weak point in healthcare; each handoff runs the risk of having key treatment information being garbled, forgotten, or not passed on. On September 12, The Joint Commission published Sentinel Event Alert 58 on inadequate handoff communications and their effect on patient care. Christopher Landrigan, MD, MPH, research director of inpatient pediatrics at Boston Children’s Hospital and the principal investigator of the I-PASS study on patient handoffs, says that just by looking at the data on the role communication plays in medical errors, one can see how huge an impact handoff can have. Nan Tomsky, MN, RN, CPHRM, a principal consultant at Compass Clinical Consulting, explains that the information provided during a handoff is key in ensuring a seamless transition of patient care. Part of the problem, she says, is that handoff procedures can vary widely within and between facilities, if they are done at all. While there are several good models and formats for healthcare organizations to adapt and develop, like SBAR and I-PASS, it’s up to facilities to adopt and tailor them for their needs.